Nicole Richie is a big fan of her Cammie Hill tie dye bag. Nicole's Cammie Hill tie dye bag retails around $400. Therefore whilst it is desirable it isn't totally affordable to everyone. 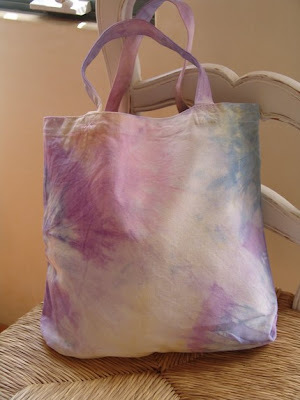 The Style Rules.com have provided step by step instructions so you can make a Nicole Richie tie dye bag for a fraction of the cost of the original. Step 1 - Pre-wash Canvas Cotton bag in warm water, then ring so that most of the water is gone. The bag should be damp when you begin dyeing it. Step 5 - Hang dry bags outside in the sunlight until 100% dry. If you want this bag but don't feel confident enough to make your own you will be happy to know you can purchase these handmade look-a-likes from The Style Rules online shop here for $27! -Bargain! aw! such a cute write up! thank you :), btw the flea market is in LA, its on Fairfax and Melrose and its every Sunday from 8-6, I believe. If you google Melrose Trading Post all the info should come up! You should definitely go, there are so many great things!